There are many ways to stop smoking, find the one that works for you. You are more likely to quit smoking by mixing and matching motivational support from an advisor with stop smoking aids or medicines. These can help you manage withdrawal symptoms such as cravings, headaches and trouble sleeping. Champix and NRT is available from the NHS with a prescription, and NRT can also be bought from pharmacies and other shops (such as supermarkets) without a prescription. E-cigarettes can be purchased from reputable e-cigarette/vape shops. NRT gives you some of the nicotine that you would have received from cigarettes, but without all the harmful substances like tar, cyanide and carbon monoxide. 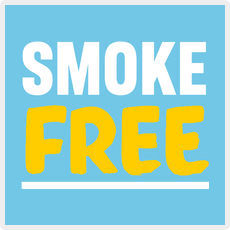 A full course of treatment usually lasts for 8-12 weeks, but because NRT is so much safer than smoking, it can be used for longer periods if it helps you to not smoke. All licensed nicotine-containing products are effective treatments to help you stop smoking, however no single NRT product is better than any other, and there are a number of options. Because NRT gives you a lower dose of nicotine than you get from cigarettes, many people use the patch to give a background dose of nicotine and one of the other products, such as the gum or the lozenges, to top this up. Once a date is set to stop smoking, you can start taking tablets one or two weeks before. Treatment normally lasts for 12 weeks. Champix is only available on prescription and is not available if you are pregnant or if you have some pre-existing conditions – for more information on whether Champix would be a good option for you, contact your local stop smoking service, doctor or pharmacist. An e-cigarette is a battery powered device that allows you to inhale nicotine in a vapour rather than smoke. E-cigarettes don’t burn tobacco and don’t produce tar or carbon monoxide, two of the most harmful elements in tobacco smoke. They work by heating a solution (e-liquid) that typically contains nicotine, propylene glycol and/or vegetable glycerine, and flavorings. There is growing evidence that e-cigarettes can help people stop smoking by managing nicotine cravings. To get the best out of it, you will need to quit cigarettes completely and use it as much as you need to with the right strength of nicotine. You can get more advice from specialist vape shops or your local stop smoking service. Public Health England conducted an independent review of e-cigarettes in 2019 and found that, based on the available evidence, vaping is around 95% less harmful than smoking. A Royal College of Physicians report came to a similar conclusion in 2016. Currently in the UK, e-cigarettes are not a licensed medicinal product, but they are tightly regulated for safety and quality. They aren’t completely risk-free, but they carry a small fraction of the risk of smoking cigarettes.